I hope you all are doing well. I hope you all are enjoying monsoons with a cup of hot tea and tasty pakoras that can’t be missed in this weather. Well, the monsoons bring hot and humid weather with it and applying several coats of skin care or makeup can be tricky as humid weather makes the skin difficult to breathe and sweat does not evaporate quickly, which then becomes breeding ground for several bacteria which can cause acne or other skin problems and we don’t want that. I love those things which play two roles, whether it is cleanser with scrub or moisturizer with SPF. Just get me stuff like that and I am sold. 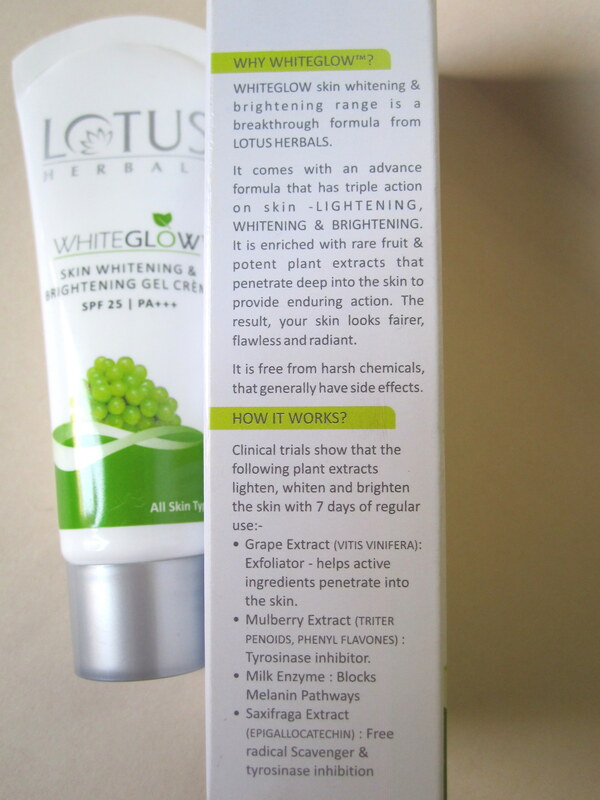 So, today I am going to review one such multi-tasking product that is Lotus Herbal White Glow Skin Whitening and Brightening Gel Crème SPF 25. So, let’s get started. 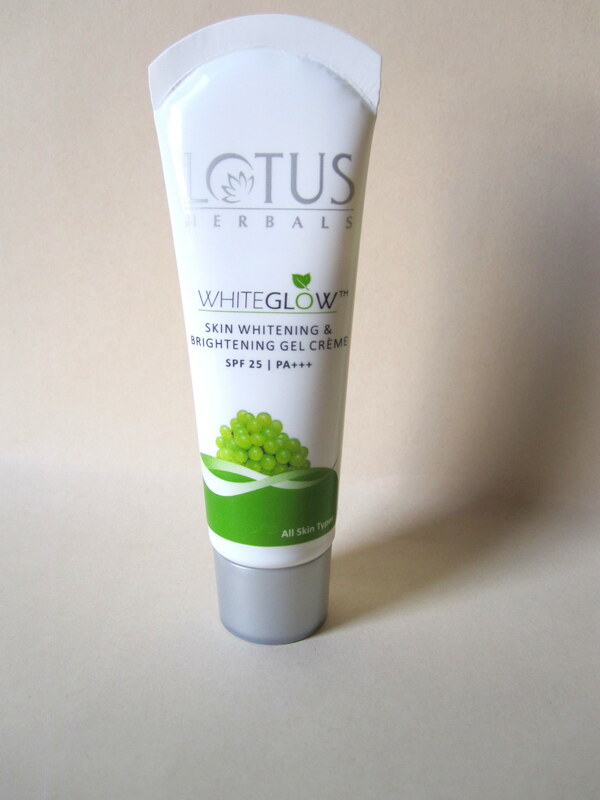 The Lotus Herbals White glow Skin Whitening and Brightening Gel Crème SPF25 is a unique formula that merges the benefits of both a gel and a crème. It is a breakthrough formula from Lotus Herbals that lightens, whitens and brightens the skin. Lightens the skin tone by reducing uneven pigmentation. Whitens the skin by reducing dark spots. 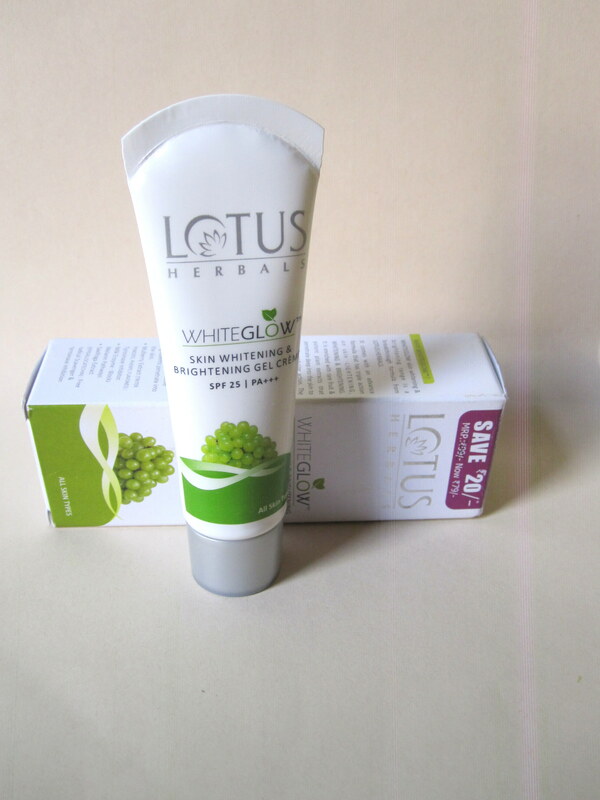 Lotus Herbals Whiteglow Skin Whitening and Brightening Gel Crème is a revolutionary fairness solution that incorporates the advantages of a gel and a crème. It spreads easily on your skin. Advanced formula allows for better delivery of active ingredients. Good for all skin types including oily and combination skin. 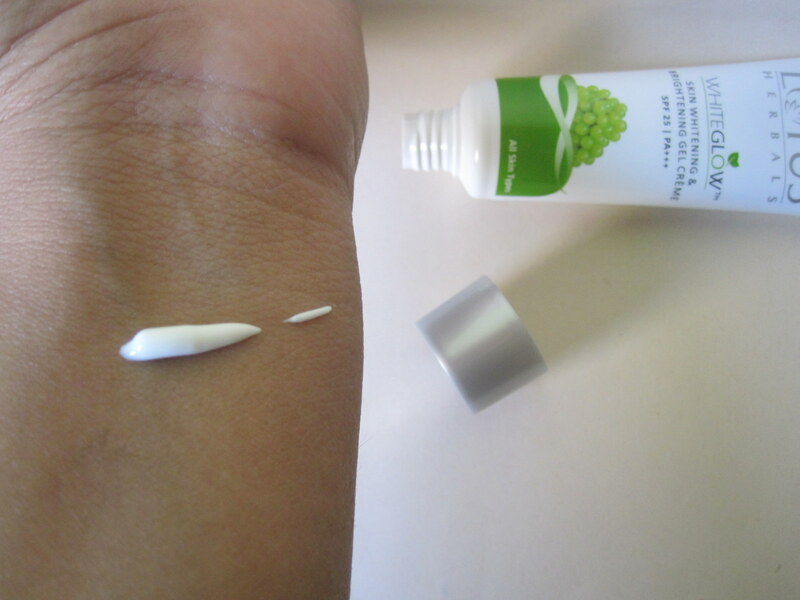 Grape Extracts (VITIS VINIFERA): Exfoliator – helps active ingredients penetrate into the skin. D.M., Water, Almond Oil, Octyl Methoxy Cinnamate, Glyceryl Mono Hydroxy Stearate, Triticum Vulgare (Wheat Germ) oil, Light Liquid Paraffin, Butyl Methoxydibenzoylmethane, Arctostaphylos Uva-Ursi (Bearberry) Extract, Camellia Sinensis (Green Tea) Extract, Lactic Acid, Glycerin, Stearic Acid, Milk Enzymes, Sodium Lactate, Propylene Glycol, Titanium Dioxide, Ceto Stearyl Alcohol, Cetyl Alcohol, Triethanolamine, Triter Penoids, Phenyl Flavones (Mulberry) Extract, Epigallocathechin (Saxifraga) Extract, Vitis Vinifera (Grape)Extract, 2-Phenoxyethanol, Tocopheryl Acetate, Methyl Paraben, Alpha-Arbutin, Fragrance. The product comes in two different packaging: jar or tub and tube packaging. The tube of lotus herbal crème is kept in white box, which contains all the details like its claims, how it works, shelf life and everything else. I bought the smaller size in tube packaging. While, the name says it’s a gel crème but taking out the product, it turns to be regular cream to me, it does not have a gel based texture even, so I guess company should not make such claims that it is gel. The consistency is okay, neither too thick nor too runny. It is light weight, which is plus point. So, it gets absorbed in skin easily. The product is white in color, like milk. The scent is a mix of fruity and floral that fades away after some time, which is a good thing. The crème is really good for summers as well as humid weather as it get absorbed instantly giving a matte finish. And presence of SPF is an additional benefit as you can easily skip sunscreen if in a hurry. The crème also does not leave any white cast behind, thus giving a total clean, natural look. It controls oil for couple of hours but not more than that. It softens the skin providing good moisture. It has not caused any kind of skin allergy or breakouts. It is very light-weight, so it instantly gets absorbed. It actually hydrates the skin which ensures that skin looks bright and glowy. It does not look dull. But the claim that in 7 days it will lighten, whiten and brighten the face, is not true. I have not noticed anything like that. Now let’s discuss about the SPF content. The SPF is really effective. It has actually prevented my skin from getting tanned as purposefully skipped on my sunscreen to check the efficacy of its SPF. It is really good for combination skin or oily skin as it keeps the skin oil-free and adds matte effect. It provides enough mositurization to face as needed. For me, it is just like a normal regular cream that hydrates well, has some natural ingredients and added SPF but nothing more than that. No lightening, whitening, or brightening for my skin despite its tall claims. But given its affordable price and easy availability not much regrets about the whitening claims. But then they should have not made the tall claims in the first place. Disappointment comes, when you buy a product thinking it to work for a specific need but it fails to fulfill your expectation in that respect. -It is very light weight, get absorbed in skin easily. – It hydrates kin very well. – It adds brightness to skin. – It got SPF in it. – It is compact and easy to carry around. – It does not provide any lighten, whiten and brighten effect to face, false claims. It is just a normal cream and it is an okay type product. It is nice cream for summers. But there’s nothing special or amazing about it except the fact, it contains SPF, which many moisturizers these days also carry. If you’re looking for fairness cream with real skin whitening properties for your oily skin, please don’t go for this one. Only go for this cream if you’re looking for a decent moisturizer with SPF for hot, humid months. Otherwise, there are so many other fairness creams in the market for the purpose. Please check out those for skin lightening or brightening. Why Australian Fashion is Rising Rapidly?